What's the Real Deal with Hawkeye In Avengers: Infinity War? So, what was Hawkeye up to during Avengers: Infinity War? We now know. 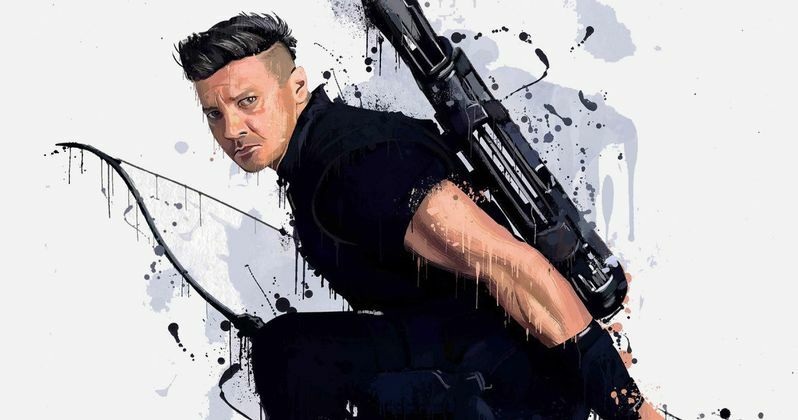 Hawkeye has been a core member of The Avengers since the very beginning and many fans have been very curious as to why he has been absent from the marketing materials. The arrow-slinging hero wasn't featured in a single trailer or on any of the posters for the movie and those who have seen Infinity War now know why that is. Warning: major spoilers ahead for Avengers: Infinity War. If you haven't seen the movie yet, this is your final advisory to turn away. So, as it turns out, the reason Hawkeye wasn't featured in any of the marketing is really simple; he wasn't in the movie. Not for a single second. Clint Barton got the shaft to some degree and didn't get to do any avenging with his fellow heroes in order to stop Thanos' forces from retrieving two of the Infinity Stones from Earth. It may not seem like Hawkeye could have been much help, but if other superpowerless heroes like Black Widow were there to help, surely he could have done some good. Now the bigger question; why wasn't Hawkeye in Avengers 3? Shortly after Captain America and his team of unsanctioned heroes, the Secret Avengers, if you will, help rescue Vision and Scarlet Witch from an attack by Black Order members Corvus Glaive and Proxima Midnight, they head back to the Avengers HQ where Rhoedy is waiting for them. Once the gang is reunited, Black Widow explains to Bruce Banner where Hawkeye and Ant-Man ended up after being freed from the prison at the end of Captain America: Civil War. While not too many details are provided, we're told that both Scott Lang and Clint Barton took a deal with the government that put them on probation of sorts, but kept them out of jail. Clint has a family to consider and couldn't afford to be locked up, so he chose to hang up his Hawkeye gear and settle down instead. Hawkeye has been given the shaft several times in the MCU and, to many fans, it may seem like that's also the case with him in Infinity War. However, this movie definitely has an Empire Strikes Back thing going on. While Marvel promised that Avengers: Infinity War and Avengers 4 aren't just a part 1 and part 2, that's more or less what's going to end up happening. Co-director Joe Russo explained prior to the release of the movie that, when it comes to Jeremy Renner's character, "Patience is a virtue," he added, "We cooked up a story for him that is a little bit of a long play. Not a short play." As for what that long play is exactly? We have more questions than answers at this point, but we know Clint will be in Avengers 4, thanks to some set photos. Plus, certain fans might riot if he just didn't show up at all. Given the way the movie ended, things could be getting pretty dark for Clint Barton in Avengers 4. Thanos wiped out half of all life in the universe with the snap of his fingers once he got his hands on all six Infinity Stones. Given that it's been teased he's taken on the Ronin persona from the comics, it's quite possible his family fell victim to this massive tragedy. That means Hawkeye is going to be pissed. No doubt, he's going to help what Marvel heroes remain and will attempt to get revenge on Thanos for what he's done.